The Sierra Club story begins in San Francisco in 1892 when the now legendary naturalist John Muir co-founded a hiking club for mountain lovers. The Club quickly became a leader in the movement to preserve America’s natural spaces from unsustainable logging, mining, sheep and cattle grazing. 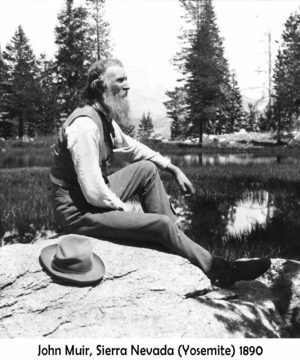 Muir had travelled extensively throughout the United States and Canada and brought to the Sierra Club a profound knowledge of North America’s natural spaces. In 1864, he had explored the woods and collected plants along the southern shore of Lake Huron and hiked the Niagara Escarpment and the Bruce Trail. In 1867, he undertook a 1,000-mile hike from Kentucky to Florida. Moving to the West Coast, he took up residence in what is today Yosemite National Park, where he lived in a cabin for an extended period. Muir believed that a spiritual link exists between people and nature. The books and newspaper articles he wrote about his experiences in the natural world are considered to have profoundly shaped how we see nature today. His writing inspired his readers, who included presidents and congressmen, to create legislation protecting vast tracks of wilderness that today form the backbone of the National Park System in the American West. The Sierra Club was to grow over the next six decades to become the largest, most effective environmental organization in North America with Chapters and local Groups in every U.S. state. In 1969, a handful of British Columbians decided to adapt and apply what they considered a winning model to fight clear-cut logging in the Nitinat Triangle and West Coast Trail on Vancouver Island. They became the first Canadian chapter of the U.S. Sierra Club. The next three decades were to witness the growth of new chapters across Canada into the organization that we have now. Today, the Sierra Club Canada Foundation (SCCF) is a national registered charity that includes four chapters: Atlantic, Québec, Ontario, and Prairie, plus the Sierra Youth Coalition, a group whose mandate is to empower young people to become community leaders. On the national level, we have earned an excellent reputation for our thoroughly researched positions and our ability to serve as a spokesperson for environmental issues Canada wide. On a regional level, the commitment of our volunteers makes us an effective advocate on the environmental issues affecting Canadians in their communities. Following in the footsteps of John Muir, we sponsor programs that help to bring nature into the lives of children and adults.